Home Market Insight Investment Is This The Bubble? 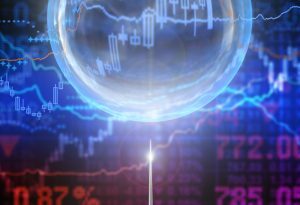 As asset prices have set new records, there have been numerous articles on whether the market is in a bubble. Bubbles occur when no one is looking for them; they are a function of greed combined with a mindset that the current ride will never end. Much is being written about the raging stock market, so we are not there yet. Every major market peak, and subsequent devastating mean reverting correction, has been the result of ingredients seen previously. Only the ignorance of their existence has been a common theme. Investors fail to recognize the major turning points in the markets because they allow emotional greed to keep them looking backward rather than forward. The media fosters this blindness by dismissing opposing views until it is too late for them to be of any use. At the peak of previous bubbles, there was no one claiming that a crash was imminent. It was always to the contrary, with market pundits waging war against the naysayers of the bullish mantra. Yet, in the end, it was something that was unexpected, unknown or simply dismissed that yanked the rug from beneath investors. No one knows what will spark the next mean reverting event, but the catalysts are present. What we do know is that an event will occur; it is only a question of when. Whatever gains investors garner between now and the next correction will be erased in a swift and brutal downdraft. This is the sad history of individual investors in the financial markets who are always told to buy, but never told when to sell. For now, the bullish case remains alive and well. The media will go on berating those who dare to point out the risks. When the crash ultimately comes, the reasons will be different than they were in the past; only the outcome will remain same.